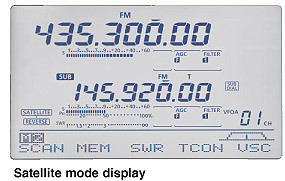 The IC-9100 has two independent receivers in one radio and receives two different bands simultaneously (See the right table for available main and sub band combinations). 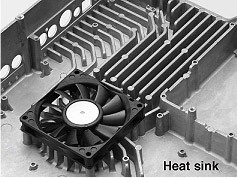 In addition, the main and sub-band audio can be controlled with independent volume and squelch knobs, and received audio can be heard separately when external speakers are connected. 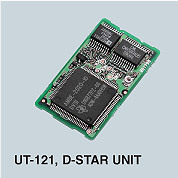 The optional UT-121 provides D-STAR DV mode digital voice and low speed data communications. Linking of D-STAR repeaters over the Internet allows you to communicate virtually anywhere. 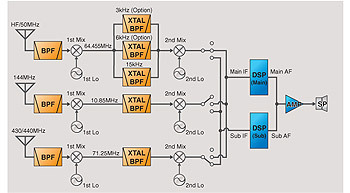 In addition to 144MHz, 430/440MH and 1200MHz band, the D-STAR DV mode can be used in 28MHz and 50MHz band simplex mode. 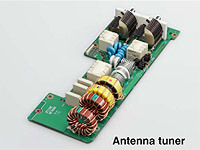 The internal antenna tuner automatically tunes for low SWR in the HF and 50MHz bands. Once you transmit on a frequency the tuner can instantly retune the frequency using its built-in memory. Automatic repeater function* and one-touch repeater function.